Last Sunday was the New York City Marathon, and it is one of my favorite days of the year. Marathon Day brings out so much support, love, and joy that is usually hard to come by on the streets of New York. (New York is always full of the magic, but you have to dig a little deeper to find the joy.) As a New Yorker going 11 years strong, I have almost always known at least one person running. Each year, marathon day adrenaline restores a little bit of my optimism. Even as a spectator, you feel proud and amazed and moved by the pure physical and mental strength that is literally running past you. And when you see a 90-year-old gramma owning an 8 minute mile, you start to regret your brunching choices and feel like you can do anything. This weekend was no different, except it was because I was cheering on a friend whose journey in running this past year has been public, vulnerable, and emotionally turbulent. As a young man who spent years struggling with mental health, Mehran tied his marathon training journey to a fundraiser for the American Foundation for Suicide Prevention. He simultaneously published a collection of essays detailing his own battle with suicide. Mehran moved from NYC (where I met him back in 2013) to SF about 2 years ago. I didn’t know him super well personally when he was here, but always enjoyed his company and hype personality in our friend group. I remember during our Sukoon Kickstarter, Mehran kept a close eye on our funding and every couple of days would top off the donation to the nearest even number. It was a small gesture but it was incredible to feel that level engagement on what would soon become a bigger dream than I could imagine at the time. And so, I was surprised by the Semicolon Series. I didn’t know anything about what Mehran was going through when he was in NYC. I remember sometimes feeling that he was a little aloof, but I never thought anything beyond it. Years later, I realize how mistaken I was, and I’m grateful that at the very least, the Semicolon Series pushed the boundaries of what I think I know, and of what I assume to be the baseline of mental health in the people around me. And maybe even of what I assume my own mental health to be. I’ve been fundraising for Sukoon over the last few weeks, and it is rigorous. Distracting. Soul crushing. Exciting. Invigorating. Riddled with uncertainty. There were a few days just in the past month where it felt like everything in my personal life and work life were colliding. It’s scary to feel so alone, to feel like no one else can quite understand the gravity of the stakes, of the decisions, of the steps required to move forward. I try to talk through it all, but when I’m tossing in bed at 2 am, only I can feel the weight of each choice on my shoulders. Investors want you to be scrappy but confident and aggressive but humble. They question you on everything you know, or that you think you know. They make you forget that you know your business better than anyone, and that metrics are just one part of the dream you’re building. They keep you on the edge of your seat with “maybe.” They ask too many questions in pursuit of the one question that no one can answer with 100% certainty: how do I know that Sukoon will succeed? I felt everything I always feel on marathon day. 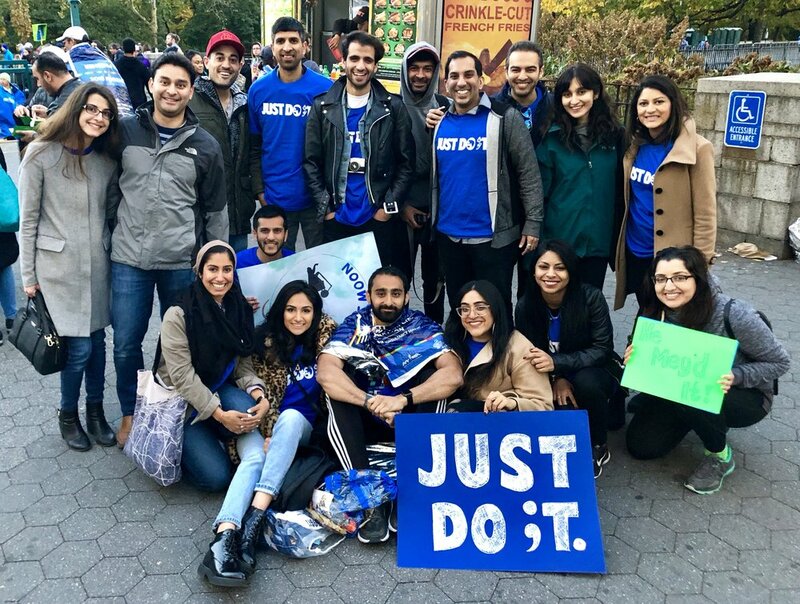 I felt the joy of the runners around me, I felt the magnitude and unity of this race that attracts travelers from all over the world; but mostly, I felt the love and community that Mehran inspired to rally behind breaking the taboo around mental health. I felt the way his 26 essays and 26.2 miles left a mark on the people who thought they knew the real him for a long time. I felt sweat, tears, joy, exhaustion and achievement in the air. And I thought to myself, I don’t know if Sukoon will succeed, but I know that it has to. For so many people, running (or any physical activity) creates a space in this world for us to be who we are. It creates an alternative dimension for us to work through the things we can’t say out loud. Sometimes it gives us the courage to start saying those things out loud. It gives us the strength to open ourselves up to trying and failing, and to explore the possibility of overcoming our greatest fears. It reminds us that there is more to life than revising pitch decks and calculating acquisition costs. It teaches us to breathe and to become resilient in the face of everyday traumas. It makes us ok with being vulnerable because we know that from vulnerability comes strength, conversation, human connection and ultimately, community. And that community is everything we could hope to experience in this world.